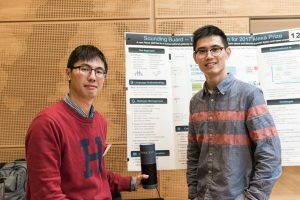 On December 6, the University of Washington Department of Electrical Engineering (UW EE) hosted its first annual Research Review Day. 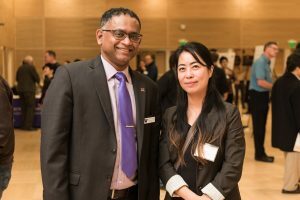 Industry partners joined University of Washington faculty and students to discuss top research in the field of electrical engineering. Graduate students showcased projects on a variety of top research themes, including AI, robotics, medical device technologies, the smart grid and wireless networks, to name a few. Throughout the evening, industry representatives voted on the best poster. 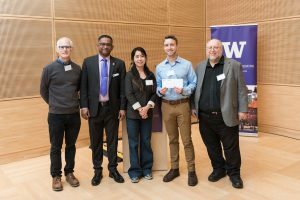 Ph.D. student Andrew Haddock and UW EE Professor Howard Chizeck received the best poster award for their project “Data-Driven Optimization of Deep Brain Stimulation for Movement Disorders.” The $5000 prize was given by Wisemont Capital. Ms. Jun Li, founder and general partner at Wisemont, presented the award. Thank you the students, faculty and staff who contributed to success of the department’s first annual Research Review Day. Thank you to the department’s industry partners, who continue to act as great resources and mentors to UW EE students. A special thank you to Wisemont Capital and Ms. Jun Li for the company’s generous contribution to the best poster prize. Our next research event will take place on June 1! We will present our second annual Capstone Fair. If you are interested in becoming a sponsor, please contact us for additional information.